Nutech EPiC Epoxy 100 is a high solids solvent-free 2 pack resin system, which provides excellent protection for concrete floor systems. It is supplied as Part A resin and Part B hardener in clear solution and is mixed with clean dry silica sand for high build and self-levelling flooring and coving. EPiC Epoxy 100 is suitable for interior use only as early loss of gloss and surface chalking are likely due to UV damage. May be top-coated to protect from UV and add colour if desired. Other non-slip additives can be used including pumice for a fine finish or carborundum for a very non slip surface. 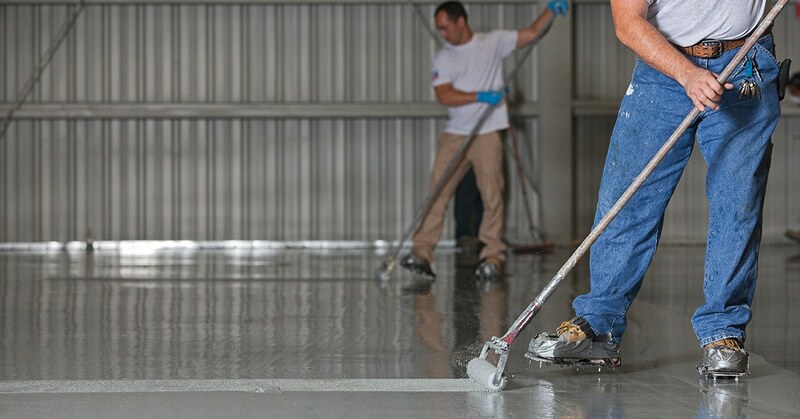 EPiC Epoxy 100 is highly recommended for food preparation areas where total moisture and vapour impervious floor barriers are required to satisfy health and cleaning requirements. Trowel – Apply by trowel. Acid etching of new or old concrete surfaces is recommended before coating with Nutech EPiC Epoxy 100. Mix one part EPiC Epoxy 100 with up to two parts clean dry silica sand to create the desired consistency for roll or trowel application. Surfaces must be clean and free of oil, rust, grease or other contaminants before coating. Sandblasting or sanding are the preferred preparation techniques for all surfaces although acid etching or water blasting may be appropriate in some circumstances. Thorough degreasing is essential before acid etching or sanding. Depending on the level and type of contamination this may require several applications of detergents, alkaline solution and/or hot water brush, roller or spray. Place the Part A in a clean container and blend in Part B for up to 5 minutes until homogenous. Be careful not to aerate the mixture due to stirring too vigorously as this will generate extra heat and shorten pot life. Allow to stand for 5 minutes and remix for at least 2 minutes before use. Unless accurate measurement can be taken, mix the entire contents as supplied. Use within 30 minutes of mixing. The reaction is exothermic and will generate heat after mixing, the greater the volume of paint mixed the more heat generated and the shorter the pot life may become. To enable a more workable & malleable product, remove mixture from drum as soon as possible once mixed. 2 Coats are recommended to achieve the perfect finish. Touch dry 10 - 24 hours. To achieve maximum inter-coat adhesion, the maximum time between coats should be 24 hours at 20°C. Subsequent coats may be applied as soon as the previous coat is touch dry and no later than 24 hours after the first coat, although in very cold temperture curing can be longer than 24 hours. Curing time is subject to ambient temperature, relative humidity, coating thickness and quantity mixed. To accelerate curing apply mild sustained heat less than 80°C. The coating will be fully cured in 7 days under normal temperature conditions. During cold weather, warming the resin to between 20°C to 30°C assists curing, before mixing the hardener. Low relative humidity may retard curing times. During cold weather curing is assisted by warming Part A to between 20°C to 30°C before adding the Part B. As a guide, add two parts clean dry fine silica sand to one part EPiC Epoxy 100 to formulate a trowel-able self levelling compound. Add additional sand to create a stiff mouldable coving compound. Top coating with EPiC Epoxy 500 within 24 hours is desirable to provide a smooth easily washable surface. Abrading or sanding of existing epoxy sealed surfaces is always required before recoating to guarantee adhesion. Surfaces should be sanded adequately to ensure that no glossy surfaces remain before recoating. EPiC Epoxy 100 is not recommended for exterior use, as early loss of gloss and surface chalking is likely due to UV damage. May be topcoated with EPiC PolyCryl to add UV protection and colour if desired.